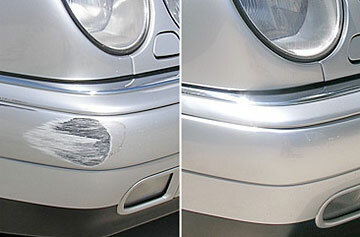 Restore your bumper to pre-accident condition. Bumpers don’t always need to be replaced when damage occurs. Instead, they can be saved with reconditioning techniques. Our experienced technicians can repair scuffed, scratched, dented, detached, and torn bumpers for much less than the cost of replacement. Wilde Bodyworx uses only the highest quality paints and sealants available on the market to keep your car looking like new. Like all Wilde Bodyworx services, our bumper repair includes our lifetime guarantee. Our professional and highly trained technicians will restore your bumper to pre-accident condition by using the finest paint products and materials in the industry. Even if your plastic bumper was damaged from a scuff, puncture, scrape, hole, tear, crack or scratch, our expert technicians can repair your bumper without replacing it.